Revit Fix: Autodesk University Podcasts. 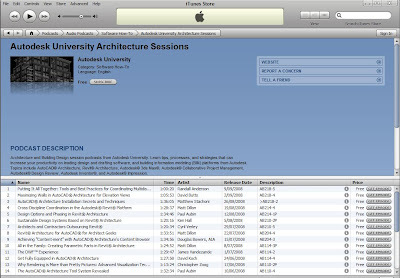 You may not have been aware, there are several Autodesk University lecture podcasts, free and available to subscribe / download in the iTunes store podcast list. Just do a search for Autodesk. Some of these are very good and are a good way to add to you knowledge of Revit and BIM.